Mets top Padres in rubber game. The Padres lost a three-game series to the Mets this afternoon, 7-3. Despite an outstanding performance on all sides the night before (offense and pitching), the Padres weren’t able to pull through Wednesday, leaving Padres fans wondering if the season of losing would ever end. Starter Mat Latos was solid, only making one big mistake. He threw six innings, allowing three runs with six strikeouts. All three runs came on a three-run homer to Mets third baseman David Wright in the third inning. (Wow, that’s a lot of threes.) Unfortunately, his offense wasn’t able to back him up and he got the loss, his 12th of the year. The Padres only got three runs in the game, with two of them coming in the bottom of the ninth. Nick Hundley doubled in Aaron Cunningham with no outs, and then Alberto Gonzalez doubled in Hundley right before Jason Bartlett struck out to end the game. But the Mets had no such problem. Angel Pagan, leading off in the lineup, had two hits and three RBIs. That, coupled with Wright’s bomb and Willie Harris’ RBI single in the eighth gave New York more than enough to win the game. Padres fans know that the team isn’t going to go anywhere, at least not this season, but it would always be nice to have some good games during the last few months of the season, like Tuesday’s 6-1 win. But a series like this shows why the Padres are 15 games out of first place: even if they are able to have a solid game, they aren’t able to carry that momentum even to a game the very next day. Consistency, momentum, whatever you want to call it, the Padres don’t have it. And that’s why they are stuck in the cellar of the NL West. 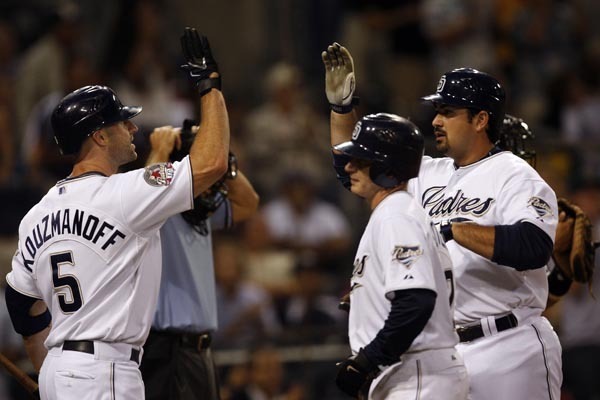 The Padres will host the Florida Marlins for the next four games over the weekend, leading up to Trevor Hoffman’s retirement ceremony before the game on Sunday. You won’t want to miss it. 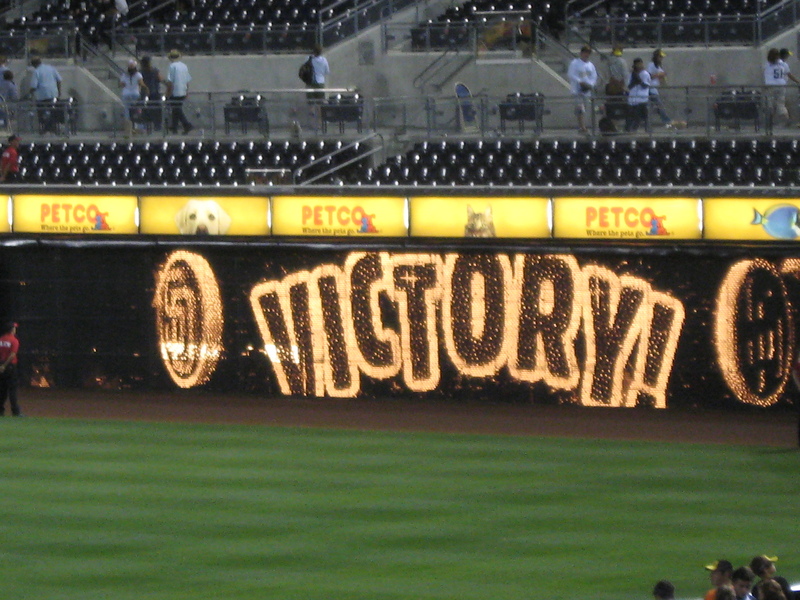 It had been a terrible game up for the Padres up to the ninth. Oliver Perez was excellent. He threw 6.1 innings, allowing only one run and two hits. Man, he shut us down! Everth Cabrera made an error in the first inning that led to two unearned runs. Otherwise, Kevin Correia was amazing. He threw six innings, allowing six hits and no earned runs. He was good too. The bullpen was perfect, yet again. Joe Thatcher, Mike Adams, and Heath Bell threw three scoreless innings. Before the ninth, the Padres had left seven runners on. The score was only 2-1, and they should have scored at least one run by then. But they didn’t, so they went to the bottom of the ninth losing by one run. I fully expected my boys to come back, though. It was only one run, and with this team, that’s gotta be possible. I didn’t think of all the opportunities they had missed already, I just thought of what they could do now. Sure, we were going up against K-Rod, but this is the new and improved Padres. Anything is possible. The innings starts. Kyle Blanks walks on five pitches. Will Venable comes up and doubles down the right field line. Blanks races all the way around and doesn’t hesitate around third as Glenn Hoffman brought him in. The throw comes in, but Blanks touches the plate and the umpire calls him safe. The replays show that the catcher did get Blanks’ hand before it got the plate, but the Padres got a huge break there. I instantly hoped that we wouldn’t go into extra innings. No no no, not that again. But we did have a guy on third with no outs. We had to get him in. We HAD to!! Henry Blanco walked, then Oscar Salazar was intentionally walked. 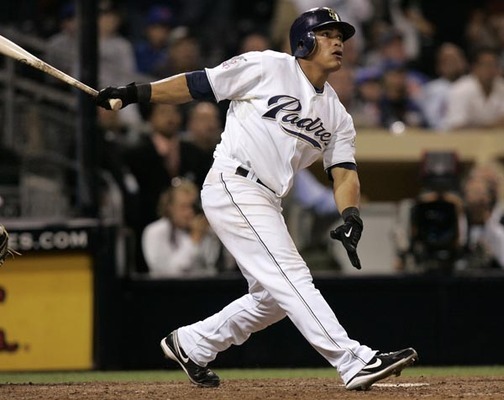 That brought up the amazing rookie, Everth Cabrera. So bases loaded, 2-2 tie, NO OUTS. I have no idea why the Mets walked Salazar to get to Everth, since Everth is clearly a better player than Salazar, but there probably were a couple reasons. Everth had struck out three times already that night. He was a rookie, and this situation could put a lot of pressure on him. But I knew that if Everth couldn’t get it done, Eck was right behind him. There was no possible way we would get out of this inning without scoring a run. So, Everth vs. Rodriguez. Rookie vs. star closer who had already blown the save. This at-bat was so stressing!! First two pitches: called strike, swinging strike. Then ball in dirt. Two fouls. One ball. One foul. One ball. You just knew that something had to give here. This was the last at-bat. Full count. K-Rod was taking his time. Finally, finally, the very last pitch was thrown. Everth hit it to right field. Ted Leitner said it would at least win the game. Then suddenly, it was gone!! WALK-OFF GRAND SLAM FOR EVERTH CABRERA!!!! Oh my goodness, it was soooooo exciting!! I was hanging onto every single pitch in that ninth inning, and we finally got it done!! It was so great. That was the Padres’ first grand slam of the year, and Everth’s second major league home run. What an excellent way to end the game, huh? Sooo exciting. I was super hyper. It was amazing!! Oh man, I love Everth. He is soooo amazing!! His defense is great, he can hit, and look, he’s only going to get better. Wow. I love him sooo much!! What an amazing baseball player. So, the Padres did what I asked for: get a split of the series. But now they have the chance to win the next two as well. How cool would that be? Mat Latos is pitching tonight against Bobby Parnell. Mat’s going to have another great outing, I think. He’s been so good in his past few starts, and I think he’s going to do very well again. And with his amazing offense behind him, he can definitely get this!! I am sooo excited about these Padres right now. They are amazing!! Let’s get this series, boys. The Padres lost the series to the Braves the other day, but last night they went out with a new mentality against a new team, and they played a great game. BUT before the game even started, there were a few interesting moves from the Padres’ front office. First, Chad Gaudin was traded to the Yankees for a player to be named later or cash considerations. I think this is really funny. There’s a article about the trade saying that adding Gaudin will give the Yankees depth. HA! Chad has been terrible all year!! I don’t think a little change of scenery is going to change that. But you never know, he might really help the Yankees out. HAHAHAHAHAHA!!! Goodbye, Chad, and good riddance. 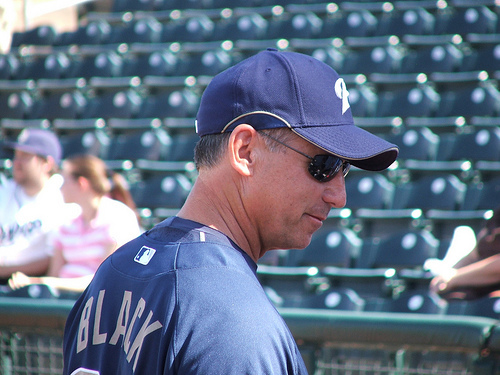 Next, the Padres extended Bud Black’s contract for the 2010 season. YAY!! Plus, there’s an option for 2011. This is Buddy’s third season as the Padres’ manager, and I think he’s done an amazing job. He’s done his best with the pieces he’s been given, and if we can give him the right pieces, he can do great things with them. I don’t blame the manager at all for the Padres’ recent misfortunes. It’s not his fault at all. Congrats, Buddy!! Now, on to the game. Clayton Richard made his second start as a Padre, and he did very well once again. He threw 5.2 innings, allowing three runs, five hits, four walks, and stuck out five. BUT he didn’t allow any runs until the sixth, which is where he ran into some trouble. He allowed two walks, two singles, and a run-scoring-double-play before leaving the game. He got his first win with the Padres! Good job, Clayton. First inning. Tony Gwynn singled, David Eckstein doubled, and Adrian Gonzalez sac-flied T in. 1-0 Padres. Kouz singles in Eck. YAY KOUZ!!! 2-0 Padres. Third inning. Eck walks. Adrian hits his 29th homer of the season. YEAH GONZO!!!! But the Padres are not done in the third, oh no. An out later, Will Venable walks, Chase Headley walks, Henry Blanco singles, and Everth reaches on a error and a run scores. Then, Clayton Richard, of all people, came up and singled in a run. It wasn’t a cheap single, either. Now that’s called helping your own cause!! Fifth inning. Chase Headley walks, and Blanco drives him in with a single. YAY!! Then the Mets get their three, but no one’s really worried. At least, I wasn’t. The bullpen was amazing, as always. Luke Gregerson went 1.1 scoreless innings, Mike Adams went one, and Edward Mujica went one with two strikeouts. In the bottom of the seventh, we went single, single, single to load the bases. T. Gwynn was then walked to give us the 8-3 lead. So, we won the first game of the four-game series against the Mets, who are not doing well at all. It was a really great game for us. Henry Blanco had three hits. Kouz had two. Adrian drove in three runs. The bullpen was solid, and we hit very well. Just a great, great game. These boys have been playing so well lately!! Tonight is Kevin Correia against Oliver Perez. Correia had a rough ending to his last outing on Sunday. Hopefully he will be a lot better today. We lost 6-2 yesterday. So much for a series win. Chad Gaudin was terrible from the very beginning of the game. He didn’t have his stuff at all, and it was not a good sign. Chad’s struggled a lot this year. If he’s not on at the beginning of the game, he’s not going to have anything for the rest of it. He got his 10th loss of the season yesterday. Yikes. He only went 3.1 innings, giving up six runs on nine hits with two walks and three strikeouts. He was terrible!! The bullpen did very well, thankfully. Luis Perdomo went 2.2 innings, Greg Burke went two, and Joe Thatcher went one. Bullpen’s been good. Starting pitching, bad. We didn’t get any runs until the bottom of the sixth. Will Venable hit a two-run homer, his fifth home run in the last seven games. We had seven hits, and that was it. This is a forgettable game. I had hoped for a series win, but the Braves jumped all over Chad Gaudin and we couldn’t get back. Now the Mets are in town for four games. You’d better get at least a series split, boys!! Oh man, that looks sooooo good!! Clayton Richard is pitching tonight against Livan Hernandez. 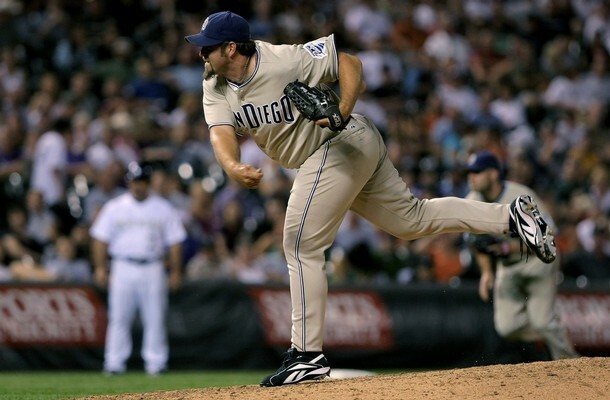 Most of us know Heath Bell’s story. He spent nine seasons with the Mets, being shipped back in forth from the major league club and Triple-A so many times that the players joked about the “Heath Bell Express”. 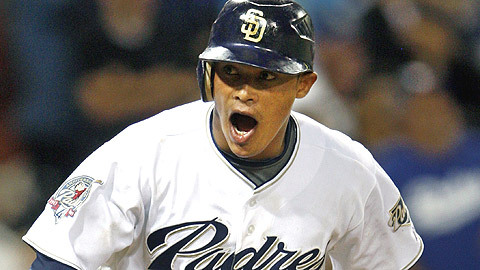 Heath was finally traded to the Padres along with Royce Ring in 2006. With the Padres, Heath got an opportunity to prove himself as a major-league pitcher. That he has done, spending two seasons as set-up man to Trevor Hoffman, and now taking over the closer’s role. It has been well chronicled about Heath’s feelings towards the Mets. He’s mostly thankful that they traded him. But while he was with the organization, he felt that they never gave him a chance. So I know it’s been great for him to be able to go out there and pitch against his former team, to show them what they missed out on, to show them that he really was a good pitcher. Heath saved the first game of the series, a 6-5 win, and he got so excited that he threw a pitch at the backstop. This time, he was so pumped up that he was throwing 96 MPH. But more on that later. Jake Peavy started the game, and gave up a three-run homer to Carlos Delgado. Obviously, things weren’t looking that great. Our ace threw 44 pitches in the first inning and gave up three runs. But my Padres don’t get put down that easy. Not these boys. In the top of the third, Henry Blanco started it all off with a walk. Rookie Everth Cabrera came up to the plate and had an extremely impressive at-bat. He was taking pitches, running the count to full, and then getting a solid single. It was great. Jake Peavy came up and laid down the perfect bunt to move over the runners for Jody Gerut. Jody singled Blanco in. NEXT! David Eckstein came up and drove Cabrera in. Brian Giles grounded out for the second out, but then Adrian Gonzalez was intentionally walked. Chase Headley came to the plate and drove in two runs with a single. Koooooz drove in Adrian for our fifth run. Then Henry Blanco, who started the inning, ended it with a strikeout. But the damage was done. We came back from losing 3-0 to winning 5-3 in one inning! I loved how we were able to play small ball, just getting singles, moving the runners over, and driving in some guys even with two outs. This offense is so much better than last year’s! In the fifth, Adrian walked and Chase drove him in with a double for our sixth run. It was great! Chase had four hits on the night, driving in three runs. Jake exited after five innings, so into the bullpen. Cla Meredith and Edwin Moreno threw one scoreless inning each. Duaner Sanchez, a former Met, gave up a two-run homer to Ramon Castro, making it a one-run game. Onto the ninth, and Heath Bell. He got two quick outs, but then it was Delgado vs. Bell, head to head. Heath wasn’t going to get this save easily. He got two called strikes to start Delgado off, then two balls. Delgado proceeded to hit four foul balls. Heath threw him a ball, and then Delgado hit another foul. Finally, finally, Heath got a called strike to save his fifth game in five chances (that leads the majors by the way). I’m almost glad I wasn’t listening to that AB ’cause it would have been so stressing! It was an excellent game. We won the series, 2 games to 1! We are still on top of the NL West with a 7-3 record, though we are tied with the Dodgers. This team is just amazing. It’s so exciting to be winning, and to have such a great team!! Today we are playing the Phillies, Chris Young against Cole Hamels. What a pitching matchup! It’s going to be a great game! Too bad I don’t get to listen to it though. I’m going on a retreat in the mountains by a lake this weekend. But this time it’s going to be for leisure and fun, instead of serving. I’m really excited, and I think it’s going to be a great weekend. I will miss blogging and listening the games and stuff, but I’ll be able to catch up when I get back. Of course, feel free to leave comments letting me know about how the Padres do or any big baseball news! What a weekend! These Padres are on a roll! Shawn Hill started the game, going five innings and giving up only two runs on seven hits. We picked up this guy like, last week. I think it’s great that he was able to pitch so well on Friday! The rest of the bullpen was great. Hill left the game with the bases loaded and no outs. Luke Gregerson came in and got a grounder to first, where Adrian Gonzalez fired it home to get the force out, and Nick Hundley threw it back to get the hitter. Gregerson then struck out the next batter. I have been really pleased with Luke this week. He’s been so solid! Let me tell you, the pitching has been incredible so far. And when the offense and defense is solid too, the Padres are going to have a good night at the ball yard. The man of the night, as he has been for many nights, was Scott Hairston. First off, he got a single and scored our first run in the bottom of the first. We got three runs in the bottom of the first, thanks in part to a Brian Giles double and a Kevin Kouzmanoff single. In the fourth, Brian Giles drove in David Eckstein with a single for the 4-1 lead. In the top of the seventh, Bengie Molina was at the plate with a runner on. He hit a long shot to left center field, and it looked like it was going out. Chase Headley was running over there from left field, but Scotty came in from center, leaping at the wall, and catching the ball. If Scotty hadn’t caught that, it would have been a tying two-run homer. Instead, Molina, disbelieving, was out. It was an incredible catch by Scott Hairston! He wasn’t done though. In the bottom of that seventh, he came up to the plate with two runners on. What does he do? He hits a three-run homer! What a night for this guy! All in all, he had three hits, drove in three runs, stole a base, and made some spectacular plays. Hairston has done nothing but incredible things since we got him in late 2007. What a player! Edward Mujica and Duaner Sanchez had scoreless innings. Edwin Moreno ran into a little trouble in the ninth, allowing a run, but he got out of it and closed the game. This was an all-around incredible game. The pitching was solid, the defense was fantastic, the offense was amazing. All the guys in the top of the order had a really good game. Scotty, Eckstein, Giles…whoo hoo! Jake Peavy. Mexico Opening Night. Adrian Gonzalez long-sleeved T-shirt night. ‘Nuff said! Jake was excellent last night, very Jake-like. His Opening Day start was solid, but he wasn’t the best. This time was the real Jake. Take 8.1 innings, 10 strikeouts, three runs, 106 pitches. He was so sharp, so on his game. It was incredible! Both starting pitchers were really good for the first few innings. Jake and Jonathan Sanchez weren’t giving up anything. Until the third. Padres catcher Henry Blanco started off the inning with a solo homer. But the Giants got that run right back in the top of the fifth. In the bottom of the sixth, the Padres took the lead for good. Henry Blanco led off the inning again, and he hit a solo homer again. Jake walked, Scott Hairston singled, and David Eckstein walked. Brian Giles flew out, but then Adrian Gonzalez hit a double that cleared the bases. It was great. Chase Headley hit his first homer of the season, getting the Padres’ sixth and last run of the night. In the top of the ninth, Jake started running into some trouble. He had 105 pitches, and his next one was a run-scoring double. So, Buddy took him out. Jake wasn’t too happy about it, I know he wanted to finish the game out. But Heath Bell came in to save his third game in three chances. He got a strikeout, then a pop-out to my boy Kouz in foul territory. Yay! It was a great win for the Padres. Jake and Henry each had a really great game. By the way, Peavy and Blanco have been working really well together. I wouldn’t be surprised if Blanco caught Jake for the rest of the season. I got to watch the majority of this game, probably from the fourth inning to the end. It was so much fun to be able to see all the players and to see the game fold out before my eyes. I never get to watch baseball, so it’s really special for me to just be able to watch a game on TV! Chris Young against Tim Lincecum. What a matchup! I knew it would be a classic game, but I thought my Padres would come out on top. We had the momentum, and CY was very solid his last time out. This time, he was even better. He went seven innings, giving up five hits and one unearned run with seven strikeouts. He even hit a single, his second hit of the season! He was mowing, man. I was really pleased with his outing. He did a great, great job. Lincecum was good, too. He seemed a lot more vulnerable than when we faced him last year. Maybe it’s just because of the confidence the Padres and their fans have. But I knew my Padres could beat him, even if he won the CY Young last year. He seems to have been off to a slow start this season. He was getting us out, but he wasn’t overpowering and dominating like last year. In the third, the Padres’ offense turned on. Jody Gerut doubled, and a few batters later, Adrian Gonzalez drove him in with a single. Chase Headley then hit his second homer of the season. In the sixth, Nick Hundley tripled to start the inning and Luis Rodriguez promptly sacrifice-flied him in. The seventh led off with Adrian and Chase each hitting a single. Nick singled to drive in Adrian and Rodriguez sac-flied again to drive in Chase. Luke Gregerson came into the game to relieve CY. He allowed two hits, but he threw two solid innings and has not given up a run yet. He’s pitched five innings so far this week. Adrian Gonzalez had two hits, Kouz had two hits, Chase had two hits, and Nick Hundley had four hits, a career high. Nick actually went single, double, triple…and single. Too bad he didn’t hit for the cycle, but still a great game for Nick. It was a great 6-1 win for the Padres. I think the best word that describes this team right now is solid. The pitching has been incredibly solid, the hitting has been solid, and the defense has been solid. This team is solid, confident, and they are winners! We’re on top of the NL West right now. I know, I know, it’s crazy early, but we’re on top! This team that is supposed to lose 100+ games is better than anyone in the West right now. They’re on a four-game winning streak, and I don’t see any stopping them. They are fired up and totally confident. They go out there every game with a winning mindset. I know it’s cliché, but this team really has it. They really think, know, that they can win every single game. I really don’t see them stopping now. I mean, I’m sure we’re going to lose sometime, but right now, we are on a roll. This team is exciting. They are exceeding expectations, they are winning, playing hard. They’re turning some heads. We can do this. We can win this crazy NL West. I truly believe that we have a chance for the playoffs this year. Of course, this is me speaking after the first week. There’s a ton of baseball left to be played. But there’s no doubt, no matter what happens for the rest of the season, we will remember this week. It was the start of hope. It was shocking, exciting, unexpected. For this one week at least, the Padres were good. They played the best baseball they’ve played in a long time. But best of all, they played together, and they won. They won five games, four in a row. This week showed how real baseball is supposed to be played. They played hard, they played solid, and they won, together. That’s my team! That my Padres! Yep, that’s us ON TOP OF THE NL WEST!! Nope, not dead last, but very first. I am so fired up about these Padres! The next victim, er, should I say opponent, is the New York Mets. Citi Field will be opening today. The Padres will have the honor of being the first opposing team in the stadium. Walter Silva will get to pitch against Mike Pelfrey. I expect Silva to be much more confident and calm as he goes out for his second big league start. Four in a row, boys. Let’s make it five.